Identifies the most overused cliches in the business management world, and then rips each one of them to shreds Every page is filled with credible advice that goes against traditional wisdom. Think there's no 'I' in 'team'? There is. Believe that together everyone achieves more? They don't. Asked to give it 110 per cent? You can't. Think employees are your greatest asset? They ain't. Got an open-door policy? For goodness sake -- shut it! 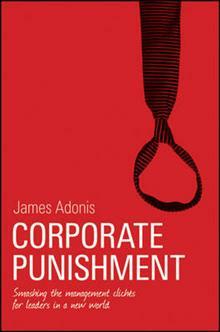 Whether you're a perpetrator or a casualty of cringe-worthy corporate cliches (or both), Corporate Punishment will challenge the way you think about the world of business and the mind-numbing management mottos that have underpinned it for decades. 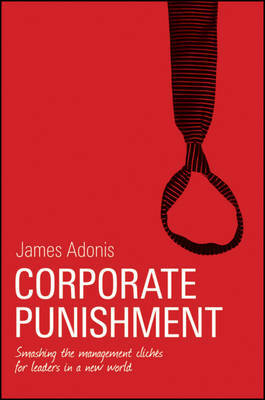 From teams and leadership to workplace culture and customer service, James Adonis smashes to pieces some of the most deeply entrenched business philosophies, offering in their place a progressive new thought process that's light on rhetoric and boring theory, but heavy on practicality and imagination. This book is a protest, a movement, a changing of the management guard -- it is the breath of fresh air every modern business needs and a long overdue break from the hot air that most are forced to endure.